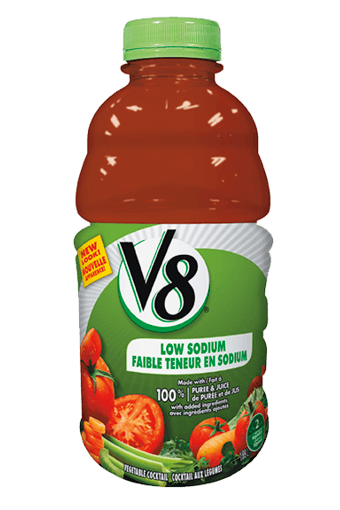 V8® vegetable cocktail is the refreshing and easy way to enjoy 2 full servings of veggies in every 250 mL cup. It’s made from a blend of garden vegetables – tomatoes, carrots, celery, beets, parsley, lettuce, watercress, and spinach. WATER, TOMATO PASTE, JUICE OF (CARROTS, CELERY, BEETS, PARSLEY, LETTUCE, WATERCRESS, SPINACH), WITH SALT AND SEASONING. *100% SUGARS FROM VEGETABLES. Nutritional Information is based on our current data. However, because the data may change from time to time, this information may not always be identical to the Nutrition Facts table found on the labels of products on shelf.